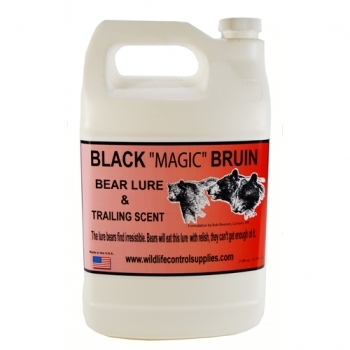 Black Magic Bruin Bear Lure, another time tested favorite, particularly among Canadian outfitters, primarily used to help Black Bear find bait stations. Bear eat it with relish and return for more. Use as a trailing scent, this cannot be over applied and is completely edible. Just use a single drop every few feet as a trailer, with an ounce or more poured over your favorite bait. Very penetrating, lingering aroma bears can"t resist.